I’m on a Virgin Train barreling out of Coventry towards London, and I am tired. We’ve just finished the fourth and final day of the InnovationLearningNetwork.org (ILN) InPerson Meeting. It is a bi-annual gathering of leaders and innovators who explore design and innovation in healthcare. And its magical. This, the fifteen gathering in seven years, meeting’s purpose was to explore spread, scale and sustainability (S3) of innovation. It’s a topic I’ve avoided…purposely. Healthcare leaders and designers new to healthcare had enough to deal with trying to understand how to be explorers, ideators, and prototypers. Its HARD and a LOT of work. Its really about the human experience. These insights give me great joy as a thinking person. They give me great pain as a designer and leader. It means that in 2012 our jobs are much harder and more exciting. If you like complex system, this is eureka. For most, it’s heartburn. The NHS shared a model of energy from Loehr and Schwartz. It blew me away, and crystalized a new power view of the Innovation Learning Network. The model suggests basic energies of change: Intellectual, Physical, Emotional, and Spiritual. You can guess where most business leaders lead their business lives. And you can also guess where innovators/designers live theirs. For me the ILN is a recharger for all four energies, but with an extra boost of emotional/spiritual. And so, I am tired. I am charged. I am changed. I am pulling into London. I am signing off. 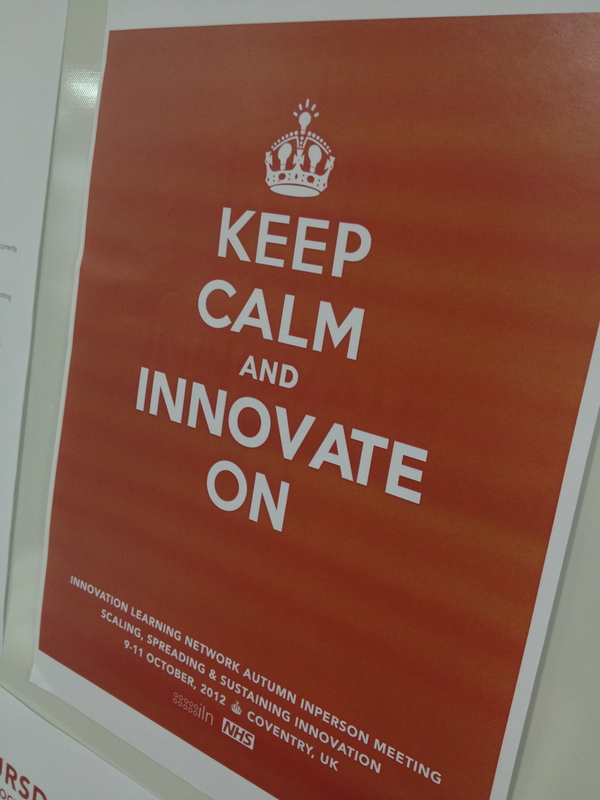 Keep Calm and Innovate On.